What is the connection between the Fashion Revolution and a group of divers at sea? And how is it possible that your next fashion item might also be made by these men in wetsuits about to jump in a diving activity to recover ghost nets? Follow us for a story you might not expect to read during the Fashion Revolution! What if we tell you that your swimwear might come from the fishing nets recovered by this group of divers and that in a way, they made your fiber. Don’t believe us? To explain how this is possible, we need to step behind for a moment. While we were preparing for the Fashion Revolution and thinking about how to participate in it, a disturbing study about the Great Pacific Garbage Patch was published. The study was led by the Ocean Cleanup Foundation and researchers at institutions in New Zealand, the United States, Britain, France, Germany, and Denmark, who published the findings in the journal Scientific Reports. According to this study, the trash within the patch seems to be accumulating or growing denser, and its levels are increasing exponentially, about 4 to 16 times larger than thought. But what struck us and the researchers was the discovery that 46% of the material found floating is fishing nets or “ghost nets”. And the worst thing is that much more plastic and ghost nets are sinking causing damage at the seafloor we can’t even see. Thinking about this, we decided to dedicate our Fashion Revolution to this problem and to give the stage to the volunteer divers of the Healthy Seas initiative who have spent the last four years recovering ghost nets from the seas around Europe and cleaning the seas from these deadly traps. Areti, Giorgos, Dimitris and Nikos of the Healthy Seas in Greece holding the fishing net they just recovered from the sea. Picture by Areti Kominou, Ghost Fishing Greece. 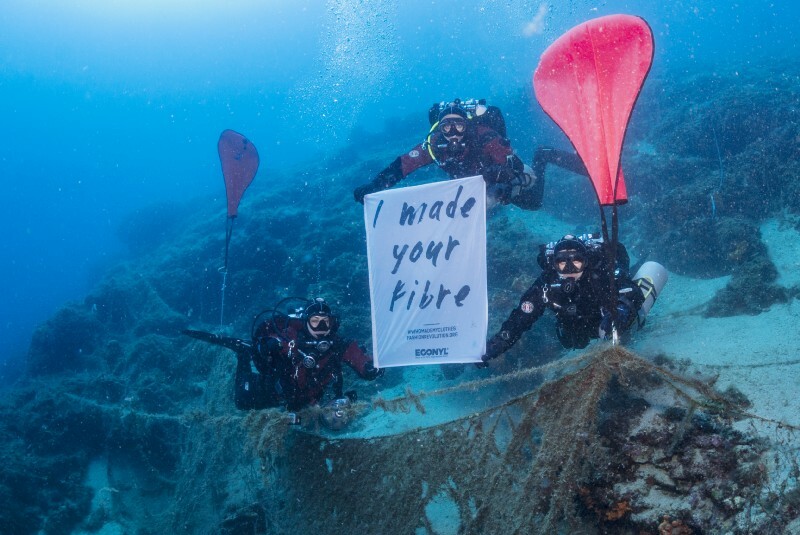 But maybe it is not clear yet the connection between the problem of ghost nets discarded in the oceans and how is it possible that your next fashion item is also made by these divers? Well, the short answer is that it might be that your swimwear, your jacket, your jeans, your t-shirt and also the carpet you are walking on might be also made with these recovered fishing nets. 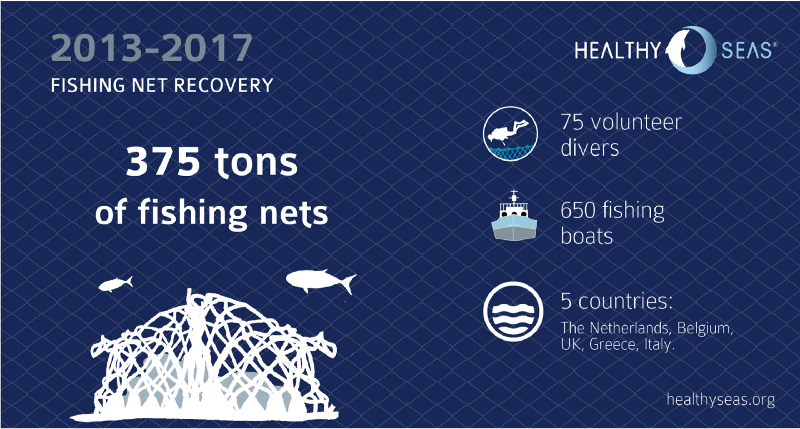 The 375 tons of fishing nets recovered by the Healthy Seas initiative in four years were in fact not just incinerated or thrown in a landfill. Instead, they became raw material to make ECONYL® regenerated nylon for new textiles. This was possible thanks to a pioneering regeneration process invented by the Italian company Aquafil that allows producing nylon yarn for textiles starting from waste instead of crude oil. That is why, searching for waste material to use in the process, Aquafil found out that fishing nets were also made of nylon, and in 2013, they founded the Healthy Seas initiative with an NGO and another business. The purpose of the Healthy Seas initiative is to remove waste, in particular, fishing nets from the seas to create healthier seas and, thanks to Aquafil, to recycle marine litter into textile products. – Textile scraps, including a pilot program of take-back with Speedo (link). By using waste instead of crude oil for the production of ECONYL® there is the double advantage of using discarded nylons that would otherwise be dumped into landfills or nature and avoiding the use of oil as a raw material. By using discarded nylons, Aquafil is able to reduce the Global Warming Potential of making nylon by up to 80%. 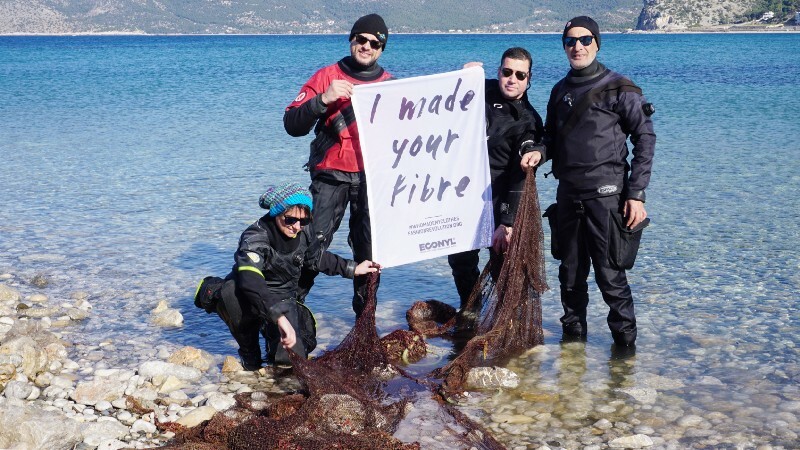 Giorgos, Nikos and Dimitris of Healthy Seas with the fishing nets they recovered in Greece. Picture byAreti Kominou, Ghost Fishing Greece. Many partners joined the initiative in these four years. Among them are brands that use the ECONYL® regenerated nylon to make apparel and carpets. So, if you are wondering who made your clothes and if Healthy Seas’ divers are behind it, have a look at the list of partners who support the Healthy Seas initiative and who use our ECONYL® regenerated nylon to make new beautiful products. Jersey Lomellina (fabric), Carvico (fabric), Kaufland, Shapes in the Sand, Moralmove, Maarï, Selvaggi Swimwear, Re-Athlete, Salt Clothing, Sage Larock, Exotic Swim, Fisch, Ruby Moon, Summerlove Swimwear, Woodlike Ocean, Everybody Sun & Swimwear, Indigo Sage, Koru, Billi-T. Along with the partners in the textiles industry, Healthy seas also has other technical partners whose invaluable work is essential to carry through with the recovery of waste and all the other activities Healthy Seas is conducting with fishing communities and harbors to prevent the discarding of the nets. Along with partners, also a special ambassador decided to support the initiative: Karmenu Vella, European Commissioner for Environment, Maritime Affairs and Fisheries. Even if you feel you are not connected to the oceans at all and your daily life is far away from every salty water spot, life on Earth would not be possible without our seas and as Sylvia Earle said in her beautiful Sea of Change, our planet without the oceans could very well look like Mars or Venus: inhospitable and with no life. “If the sea is sick, we’ll feel it. If it dies, we die. Our future and the state of the oceans are one”. Sylvia A. Earle, Sea Change. Lately, there has been a lot of talking about marine waste and marine plastic. Up to the moment data suggests that at least 1/3 of the plastic in the ocean is discarded fishing nets. Now, the latest study on the Great Pacific Garbage Patch reveals that the amount of discarded fishing nets floating among the trash could be much more. These deadly traps are nets that have been abandoned or lost at sea and continue to kill and harm marine life all over the world. Healthy Seas’ diving coordinator Pascal in Croatia. Picture by ®Cees Kassenberg. The problem of ghost nets has four main consequences. 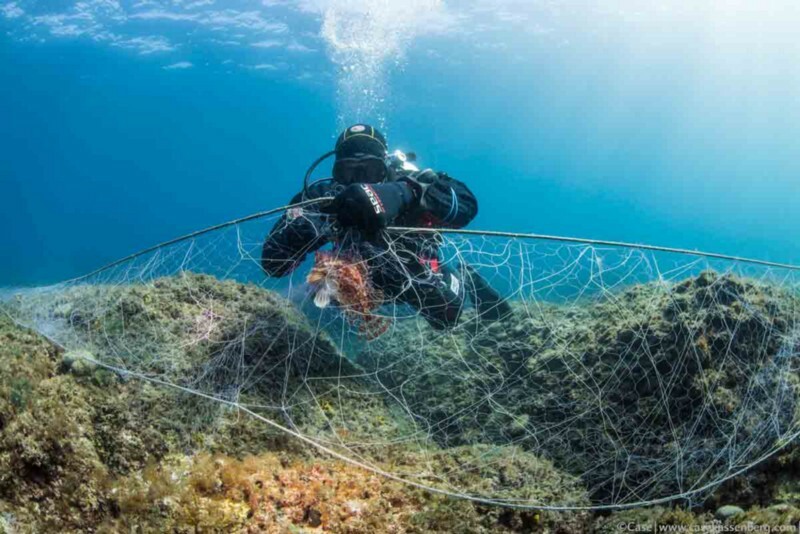 First, the nets are diminishing an already devastated feedstock with what is called bycatch — the unwanted capture of any fish that get trapped into the discarded nets stuck into the bottom of the oceans or in shipwrecks. A second consequence is that floating or drifted nets can also catch other marine animals like turtles, dolphins, whales or birds. Third, small communities that are living on the cost suffer the effects of the discarded nets with problems to vessels and boats stuck in them and with a big decrease of fish stock, which is often the primary protein source for these communities. The last consequence is over time. These nets can stay in the water fishing for 500 years, and year after year they start breaking apart into smaller pieces that can contribute to the microplastic problem and can sink to the bottom of the ocean. By recovering these nets before they start disintegrating, we hope to avoid more plastic from depositing into the sea bottom. Fashion Revolution starts with you. As a consumer, you have the power to make the change. Your shopping habits influence what the industry offers. By choosing unsustainable clothes, not caring about where they come from, who made them, or what is in them, you give the industry a signal that you are fine with that. On the other hand, if you demand sustainable products that are not produced at the expense of the environment and people, companies will adapt, and more will join the sustainable fashion revolution. 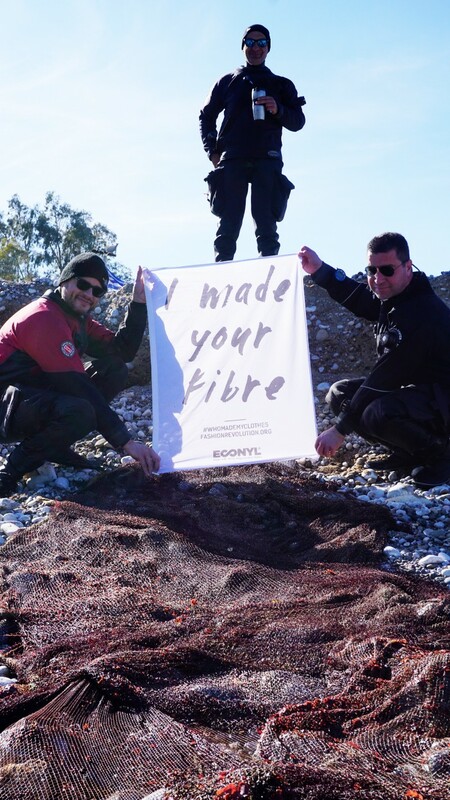 If you are intrigued by our story or have a product made with our ECONYL® yarn, please share the story and the pictures of our fashion revolution, and if you can, please sustain the Healthy Seas initiative by donating to support more diving activities to recover more deadly ghost nets. As always, be curious, check labels, look for materials used, check websites for sustainability practices, and ask questions about how clothes are made. Anastasia, Giorgos and Tasos of the Healthy Seas initiative recovering a big ghost net in Greece. Picture by Areti Kominou, Ghost Fishing Greece. 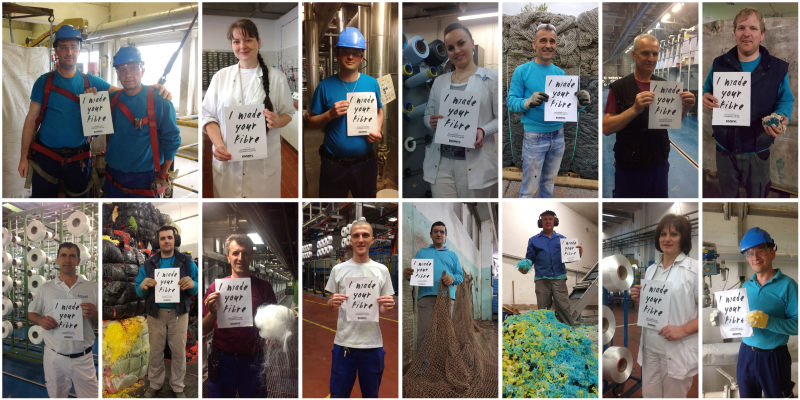 Pictures of Aquafil’s workers in the ECONYL® Regeneration plant. This article was originally published on Medium. Check out others article you might be interested in.